Was HURRICANE MICHAEL really a Cat 5 superstorm downgraded for political purposes in order to shirk financial reimbursement obligations? Some Bay County officials and residents are pushing for the Cat. 5 label on Hurricane Michael, both as leverage to try and win a higher reimbursement from FEMA, but also as validation and a badge of honor for a region feeling increasingly forgotten by the rest of the country. 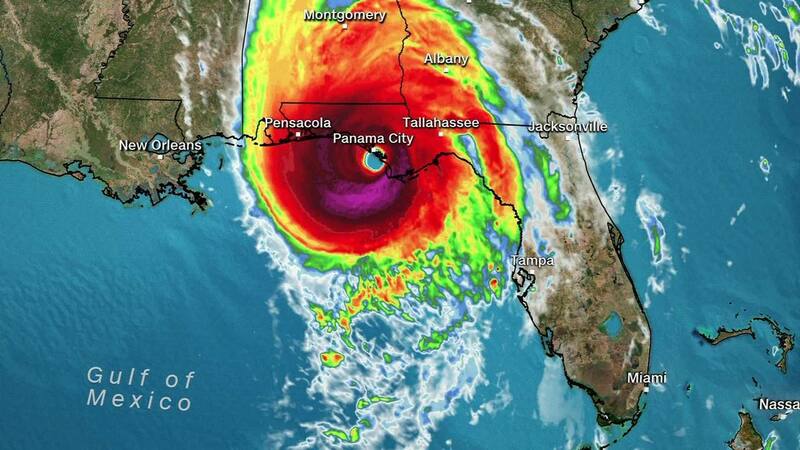 PANAMA CITY — Two-and-a-half months after the historic storm ripped through the Florida Panhandle with 155 mph sustained winds, there is a growing call among officials and residents to have Hurricane Michael classified as a Category 5 storm. Anderson has been one of the most vocal proponents for the Cat 5 designation since Lynn Haven’s city buildings disintegrated around her and other city officials and employees as they huddled together for safety. She watched as brick buildings were pulled apart, roofs peeled back like the lid of a sardine can and 5-ton air conditioning units lifted and tossed by the wind. That, Anderson contends, could not have been the work of a Category 4 storm, even one as strong as Michael. “My research has convinced me this storm was a Category 5,” Anderson said. As it stands on the conventional Saffir-Simpson Hurricane Wind Scale, the standard used by the National Hurricane Center based on sustained wind speeds, Hurricane Michael was a very strong Category 4 with its measured 155 mph sustained winds upon landfall. That puts it within tasting distance of a Category 5 label, which kicks in at 157 mph. That 2 mph might not seem like a big difference, but for Anderson and other officials in the Bay County area, it’s 2 mph worth fighting for, both as a badge of honor and leverage as Bay County and its municipalities are drowning trying to clear 40 years worth of debris left by the storm and bogged down in the bureaucratic muck that is reimbursements from the Federal Emergency Management Agency. In the past two weeks, Bay County and its largest municipality, Panama City, have had to take out $50 million loans to help pay for the hurricane recovery effort as costly items like debris removal — expected to cost hundreds of millions of dollars for the county — must be paid upfront, with a reimbursement to come later. Even then, FEMA will reimburse only 87.5 percent of what was paid and it could take years, as Monroe County has seen only $3 million of its expected $43 million reimbursement more than a year after Hurricane Irma. While the county and larger cities are better equipped to weather the blow to their budgets, smaller communities, like Parker, are facing a storm debris removal bill larger than their annual budgets. But a Cat 5 designation, Anderson believes, would make it difficult for the state and federal governments to deny the area a 100 percent reimbursement from FEMA. She’s even called on President Donald Trump, who visited Lynn Haven in the days after the storm, to sign the declaration for the reimbursement. But the Cat 5 designation is more than just fiscal leverage. Perhaps more importantly, it would be a badge of honor for an area that has increasingly felt forgotten by the rest of the country, even as many residents still are without such basics as power and internet, many businesses remain closed and many destroyed buildings have yet to be touched. It’s validation for a population feeling fatigued from having to live in a disaster area, fighting with everyone from insurance companies to FEMA, and angry at the circumstances and the response they’ve seen. “And it’s like, ’What are you talking about? We got carpet bombed. … This was like Baghdad, but the trees were the missiles,” he continued. Complicating matters is that Michael was so catastrophically damaging that the storm actually destroyed or otherwise caused much of the equipment designed to measure its force to malfunction. Wind speed monitors stopped working after 129 mph gusts were recorded at Tyndall Air Force Base and sensors mounted to light posts and pier pilings to measure storm surge were tossed around in 15 feet of surge and winds the equivalent of an EF-3 tornado, leaving the U.S. Geological Survey and National Oceanic and Atmospheric Administration to gather the data and piece it together like a puzzle. According to a NOAA spokesman, the full report on Hurricane Michael should be available in February or March. Anderson, though, is confident the data will yield the Cat 5 label she has been pushing for.